One of the greatest benefit of visiting a farmer's market is that I can be certain that I will be able to procure the freshest and best in season produce. While all the big established supermarkets are selling ingredients from around the world that had travelled for miles to get here, our local farmers have been quietly knocking out all these amazing and delicious produce on our doorstep. The quality is often much higher and taste far superior than anything you will ever get from those supermarket. My recent visit to the newly spawn Brockley Market down in Lewisham had further reinforced this belief. Lots of beautiful produce and all from people who were passionate about their handiwork. A brief chat with them was like taking a quick masterclass of how to grow your own veg. Within the first 10 minutes of being there, I've bought two of my favourite spring delights - courgette flowers and wild garlic. I love courgette flowers. Ever since I had them deep-fried in Rome a few years back, this has been a firm favourite of mine. Whenever the beautiful tiny green stalks with the eyecatching yellow floral tip is within sight, I will almost certainly grab them without any hesitation. The same goes for the wonderfully sweet fragrant wild garlic. So it is with this in mind that I thought I will make some delicious light tempura using this two delightful ingredients. Recently, I have been quite wound up by a number of celebrity chef who have been claiming that anything that were dipped in batter and deep fried are known as tempura. That is just plan wrong. A tempura batter has to be light - very light infact. It should never be thickly coated with batter as this will cause the tempura to steam and will never give you that ultra crisp texture a good tempura is synonymous with. This is achieved by using ice cold water to mix the batter with and the batter has to be made at the very last minute, just before using. So before any chef start claiming everything as tempura, please check your facts! Prepare the dipping sauce by mixing all the ingredients and set aside. To stuff the courgette flower, open up the flower of one of the courgettes, taking care not to tear it. 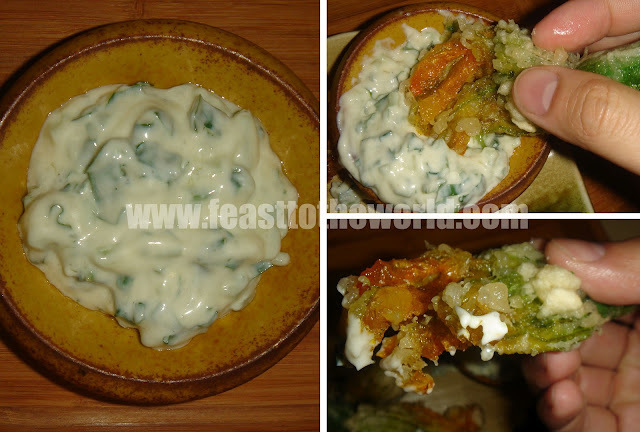 Carefully filled the inside with the chopped wild garlic with a teaspoon. Twist the petals back around the filling to seal. Repeat the process with the remaining baby courgettes. Heat up the oil in a large saucepan to around 180ºC. Test the oil by dripping a bit of the batter, it should sizzled almost immediately. 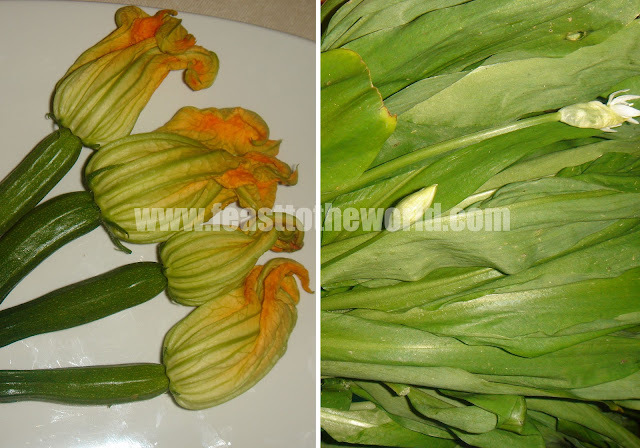 Dip the stuffed courgette flowers in the tempura batter, one at a time, and carefully owed them into the hot oil and fry fro 2-3 minutes, until golden brown and crispy. 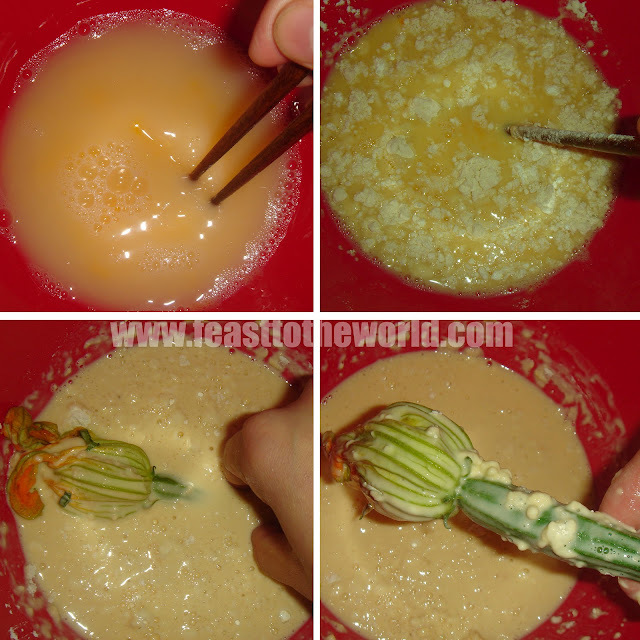 Remove with a slotted spoon and drain on kitchen paper and keep warm while you repeat with the rest of the stuffed courgette flowers. 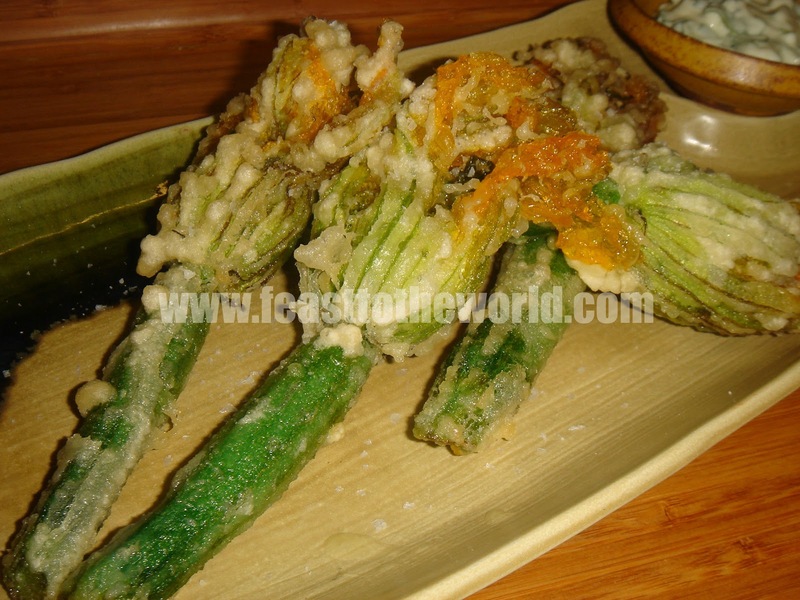 To serve, pile the tempura courgette flowers onto a serving plate and sprinkle with a pinch of sea salt. Place the dipping sauce on the side and enjoy them while it's hot.